I have to say, when I read news today that a”hypermuscular” former FBI agent got busted for planning to murder people and attempting to rip off an Orange County drug courier–and was Vietnamese, my first thought was, “Wow, there was a Vietnamese FBI agent? Cool!” And my second thought was, “Oh man, he’s a totally crooked killer guy. Bad Vietnamese guy. Bad!” I know, I know. But the disappointment only grew when I learned just how Vo Tran, the 40-year old that was fired by the FBI in 2003 for a number of offenses (including attempted bribery of a Vietnamese official) was harpooned. Vo Duong “Ben” Tran, 40, told a government informant secretly recording him that he had been a sports bookmaker and wanted to kill people across the country who owed him money, including a man from Redlands, Calif., who was in debt to him for more than $200,000. Um, I’ve never actually ordered a successful hit, and I am certainly not a former FBI agent that once investigated organized crime, but in my opinion, jabbering on to your hitman is just sloppy. Shouldn’t such experience make a person BETTER at crime? I guess he didn’t study that hard. Just sayin’!! I guess now, homey isn’t just former-FBI, he’s also FUBARed. Funny Time with Jen Jr. and Diana Jr. Ever wonder what a typical day with young, Pre-DISGRASIAN Jen and Diana was like? Ahhh…So precocious! Even as tots, we understood the joys of laughing like assholes at the shortcomings of others. The Miami Heat proved Sunday that they could not run with the Chicago Bulls, getting swept in the series. It was the first time in 50 years that a defending champ got eliminated in the first round of playoffs. 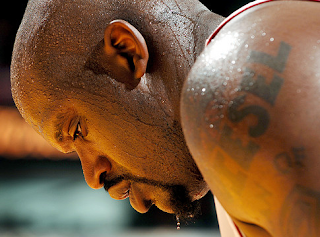 I’ve just got a few words to say to DISGRASIAN Hall-of-Famer Shaquille O’Neal. You old. You ugly. You done. Oh, and CHING CHONG CHING CHONG CHING CHONG muthafucka!